Pride Niagara is very grateful for the support of our local and national community groups. We value each of their efforts in the continued journey of making the Niagara Region a fantastic place to live for the LGBT+ community. We encourage everyone to remember the businesses and organizations that identify themselves as LGBT+ positive, support Pride Niagara events and our LGBT+ community. Please give them your business and support in return. RECORD BROKEN – On Saturday June 9, 2012, during Pride Niagara’s first Pride in the Park festival in Montebello Park, St. Catharines. A fabulous performance on our stage took place that not only entertained but broke the Guinness World Record for Largest Drag Queen Stage Show. Pride Niagara would like to acknowledge and thank all the fantastic entertainers who made this achievement happen including the organizer Shannon Unrau from Nathan Drake Productions (#NDproductions) who donated her time and abilities to make this dream a reality. 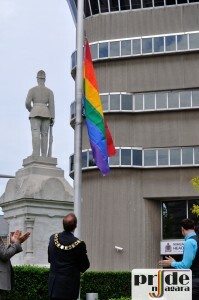 Thank you all for also helping get Pride Niagara’s name out there for the world to know. It’s dedication like this that makes being a part of the LGBT here in Niagara simply amazing.